Shimla: Everybody is equal before law and the law does not discriminate between on the basis of religion and region irrespective of ones status, caste, creed and religion, stated Justice A.M. Khanwilkar, Judge of Supreme Court of India during a lecture series on ‘Different Facets of Indian Constitution’ organized by Himachal Pradesh State Legal Services Authority today. Justice Khanwilkar said that though it was a challenge for judiciary to provide justice to the last man residing in the last corner, but it was equally important to do so. He said that justice was multi-dimensional concept and the Bar members should keep in mind the time frame for providing justice. He said that no matter how influential a wrong doer is, he should be penalized for the crime as a slight slackness and leniency could lead to loopholes in delivery of justice. 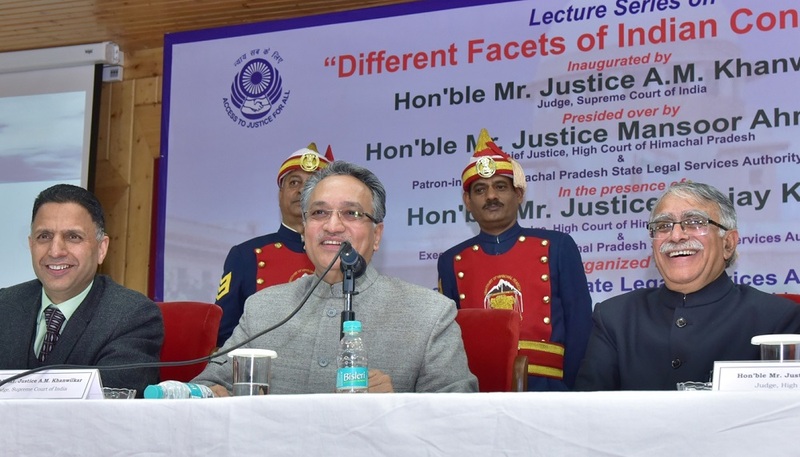 The people have unflinching faith in judiciary and look at the doors of the Courts as the last resort for getting justice and it was the duty and responsibility of the judiciary to provide justice to them, said he. The Constitution has clearly defined fundamental rights for the citizens of India which makes them equal before law. He said that the delay in justice raises doubts in the judicial set up and we should ensure speedy justice to the people. 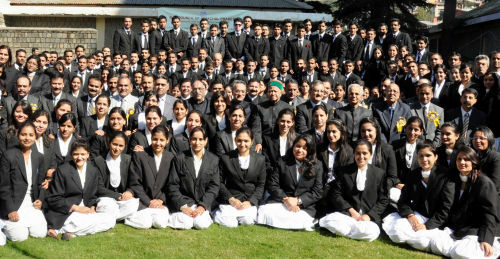 Justice Khanwilkar said that it was matter of concern that even today 80 to 90 percent of people were deprived of the justice they deserve and we should make full use of modern techniques and technology to ensure transparency and justice to them, besides adding to the responsibility. Justice Khanwilkar said that he want to highlight the issues of contemporary relevance, in the context of importance of December 10th as the Human Rights Convention was signed by the United Nation on the same day in year 1948. Since then this day is being celebrated as “Human Rights Day”. Hence it will be apposite to talk about “Access to justice”, which is no less a cornerstone of basic right or Human Rights, which every citizen in a civilized society must naturally enjoy. Justice Khanwilkar said that our constitution declares- “to secure to all its Citizens Justice-social, economic and political” to fulfill this objectives, much would depend on the effectiveness of the State Machinery and State responsiveness to the problems of the Society and its citizens. He also said that law delays, expensive court fees, uncertainty both in matter of articulation of law (legislation) and also in decision making process by the courts, unequal opportunity to litigants, multi forums, lack of awareness of rights and remedies, insufficient judge ratio are some of the issues which needs to be focused in the present time.